Cherie Priest. Photo by Aric Annear. The Gaslight Gathering Steampunk and Victoriana Convention makes its spectacular return on May 2-4, 2014. Offerings at the gala event include the Friday Night Concert with Professor Elemental; the Junto Academy, featuring demonstrations and workshops in the arts of steampunk making and costuming; the Art Salon; the Martian Maker Room, an exhibition of the many mechanical contrivances and scientific advances insprired by the Conquest of Mars; and the Gentleman Steampunk and Victorian Fashion Show. Cherie Priest will be the Writer Guest of Honor. Other guests TBA! Meet Benjamin Lorr as he reads from his debut book Hell-Bent. Cherie Priest reads from "The Inexplicables"
Cherie Priest is the author of eleven novels, including the steampunk pulp adventures Dreadnought, Clementine, and Boneshaker. Boneshaker was nominated for both the Hugo Award and the Nebula Award; it was a PNBA Award winner, and winner of the Locus Award for Best Science Fiction Novel. 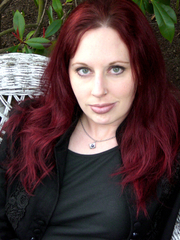 Cherie also wrote Fathom and the Eden Moore series from Tor (Macmillan), Bloodshot and Hellbent for Bantam, and three novellas published by Subterranean Press. In addition to all of the above, she is a newly minted member of the Wild Cards Consortium - and her first foray into George R. R. Martin's superhero universe, Fort Freak (for which she wrote the frame story), which debuted in 2011. Cherie's short stories and nonfiction articles have appeared in such fine publications as Weird Tales, Subterranean Magazine, Publishers Weekly, The Living Dead 2, and the Thackeray T. Lambshead Cabinet of Curiosities. Though she spent most of her life in the southeast, she presently lives in Seattle, Washington, with her fat black cat. We will also have some Steampunk music at this event and a costume contest - come in Steampunk attire and a randomly-drawn winner will win a FREE copy of Cherie's new book! About the book: Rector "Wreck 'em" Sherman was orphaned as a toddler in the Blight of 1863, but that was years ago. Wreck has grown up, and on his eighteenth birthday, he'll be cast out of the orphanage. And Wreck's problems aren't merely about finding a home. He's been quietly breaking the cardinal rule of any good drug dealer and dipping into his own supply of the sap he sells. He's also pretty sure he's being haunted by the ghost of a kid he used to know-Zeke Wilkes, who almost certainly died six months ago. Zeke would have every reason to pester Wreck, since Wreck got him inside the walled city of Seattle in the first place, and that was probably what killed him. Maybe it's only a guilty conscience, but Wreck can't take it anymore, so he sneaks over the wall. The walled-off wasteland of Seattle is every bit as bad as he'd heard, chock-full of the hungry undead and utterly choked by the poisonous, inescapable yellow gas. And then there's the monster. Rector's pretty certain that whatever attacked him was not at all human-and not a rotter, either. Arms far too long. Posture all strange. Eyes all wild and faintly glowing gold and known to the locals as simply "The Inexplicables." In the process of tracking down these creatures, Rector comes across another incursion through the wall-just as bizarre but entirely attributable to human greed. It seems some outsiders have decided there's gold to be found in the city and they're willing to do whatever it takes to get a piece of the pie unless Rector and his posse have anything to do with it. Cherie Priest's book Hellbent was available from LibraryThing Early Reviewers. Cherie Priest's book Bloodshot was available from LibraryThing Early Reviewers. Cherie Priest is currently considered a "single author." If one or more works are by a distinct, homonymous authors, go ahead and split the author. Cherie Priest is composed of 2 names. You can examine and separate out names.